Your ancestors, before Noah's Flood, got vitamin MePA in their drinking water. 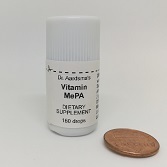 Dr. Aardsma's Vitamin MePA Dietary Supplement is sold as a liquid in a convenient dropper bottle. Each day, simply add one to three drops to a glass, fill the glass with water, and drink it. You will then be getting vitamin MePA the way your long-ago ancestors did. The Biblical Chronologist is ready to sell Vitamin MePA to you as a patent-pending dietary supplement for $29.95 per bottle of 160 drops (about 19¢ per person per day). However, the law requires that the U.S. Food and Drug Administration (FDA) be involved. FDA does not approve dietary supplements, but it holds veto power over their introduction into interstate commerce. Bureaucratic wheels turn slowly. It may be many months before we have a green light from the FDA to sell the vitamin. The FDA Journal page is designed to keep you informed and up to date on this process so you can understand what the holdup is. Send us a prepaid postal label with your name and address on it, and we will send you a bottle (limit one per label) of Dr. Aardsma's Vitamin MePA Dietary Supplement for free. If you are supplying a family, you need only one bottle as everyone in the family can use the drops from the same bottle. By mailing us this label, you spare us the expense of postage and the expense of data entry (you have entered your address for the mailing label, so we don't have to). Please do not email the label as a pdf; this creates extra work at this end. If you are able to give a gift to help with the task of bringing vitamin MePA to the world, please do. Dr. Aardsma is not independently wealthy, and this work has neither government grants nor corporate funding behind it. Click on the "Give a Gift" icon in the banner ribbon at the top of this page to give now using PayPal, or simply include a check made out to "The Biblical Chronologist" with your label. Note that your gift will be a tax-paid gift, not a tax-deductible donation (we are not a non-profit corporation), so the package bearing your bottle of Dr. Aardsma's Vitamin MePA Dietary Supplement will contain neither an invoice nor a receipt. If you are elderly and not very computer savvy, or if for any other reason you are unable to send us a postal label, please do not let that stop you from getting the vitamin you need. If you have a U.S. mailing address, just send us your name and address typed or printed on a 3×5 card (or similar piece of paper) and postage stamps totaling $7.35 and we will mail you a bottle of Dr. Aardsma's Vitamin MePA Dietary Supplement for free. If you are located outside the United States, email hea@AardsmaResearchAndPublishing.com for assistance. Our mailing address is: The Biblical Chronologist, 412 N Mulberry St, Loda, IL 60948.